Stewart Varner, digital scholarship coordinator for DiSC, and graduate students view a project in the new Research Commons. DiSC hosts workshops, rountable discussions and various guest speakers throughout the year. DiSC Spring Symposium: "Disability and Technology"
In 1899 in Newnan, Ga., Sam Hose was accused of murdering a white man and attacking his wife. The Springfield Daily Republican (Springfield, Mass.) reported on the lynching: "The black man was first tortured before being covered with oil and burned." Even before the body had cooled, the crowd of 2,000 rushed forward to claim "souvenirs" – crushed bits of bone, a crisply cooked liver, a piece of his heart. Emory sociologist Roberto Franzosi has collected more than 1,200 newspaper clips about lynchings in Georgia from 1875 to 1930 — like the story of Sam Hose — and is applying a research methodology and software program he developed to catalogue and analyze the narrative data. Franzosi is currently at work on a book on lynching. But he is pairing this traditional scholarship with a more innovative form – using digital scholarship to visualize the human drama that drives history. Franzosi's Georgia Lynching Project is one of the first four projects of the new Digital Scholarship Commons (DiSC), which helps faculty and graduate students harness digital tools and resources at Emory to create powerful and engaging scholarship. DiSC is the flagship tenant of the new 4,500-square-foot Research Commons on the third floor of the Woodruff Library. "Just as we see the university library as the intellectual commons of the university, we see our Research Commons becoming a transdisciplinary bridge between the humanities and social sciences, connecting faculty, students, the campus and the community in new and different ways under this digital flag," said Vice Provost and Director of Libraries Rick Luce at the grand opening of DiSC on Feb. 1. Featuring cutting-edge technology and a collaborative environment with modern, movable furniture, DiSC "is intended to be a virtual and physical laboratory in many ways," said Luce, "a center that brings together human expertise, new technologies and collaborative space to do some new and exciting work that we couldn't do using traditional methodologies." 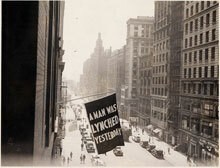 Lynching flag flying at NAACP headquarters, circa 1938. Photo courtesy of the Library of Congress Prints and Photographs Division, NAACP Collection. Franzosi's was one of the first four projects awarded funding under Emory University Libraries' two-year $695,000 grant from the Andrew W. Mellon Foundation that established DiSC and provides startup funds to launch a select number of collaborative digital humanities projects that will draw on the library's collections and services in new ways. A digital scholarship project requires a unique kind of collaboration. DiSC pairs scholars with project managers, digital humanities and librarian consultants, web developers and software engineers, who will shepherd the digital project from concept to completion. The Georgia Lynching Project will make Franzosi's remarkable collection of data about nearly 500 lynching victims in Georgia from 1875 to 1930 accessible through an interactive web interface that will engage broader public understanding of the material. The project "eventually will create the first website of its kind," says Franzosi. "The website is going to be very interesting because you can search for people, you can search for events, you can search for places. You can read the original newspaper articles." Using visualization tools like GIS mapping, he says, "you can see: Who was involved in the violence? Who was involved in fleeing, hiding, searching?" Another tool, called network graphs, will provide a visual map, a collective snapshot of the social relations of lynching. "As a social scientist, I'm trying to find predictable patterns in this social phenomenon," Franzosi explains. The project can offer new insights into trends connecting instances of lynchings in Georgia with implications for the broader study of lynching in U.S. history. Digital scholarship is not new to Emory – a few faculty pioneers and publications "have been leading the way in terms of inventing what digital scholarship is," remarked Luce at the DiSC grand opening – and DiSC Coordinator Stewart Varner sees the new endeavor as "an evolution, not a revolution." The rising generation of students has integrated technology into their lives, and as more scholars explore how their work might be enhanced by digital scholarship, "these can no longer be one-off projects," says Varner. "We need to get out in front of this and create a process, if for no other reason than there's a set of very basic library questions you always have to answer, such as: How's copyright going to work? What sort of metadata standards are you using? "The library has always been a place where research projects emerge and librarians have always worked with scholars to create them," says Varner. "It's just that now those projects might be interactive maps loaded with historical data and displayed on mobile devices. Librarians would still be crucial partners, but they might find themselves recommending content management systems and advising on how to design digital projects with long-term access and preservation in mind." Varner hopes the Emory community will visit the Research Commons, learn more about DiSC and be partners in its future. "There's an opportunity to shape how this moves forward, how it evolves," Varner says. "We look to faculty, students and administrators to keep lines of communication open, to let us know what they need so we can support them." To learn more about working with DiSC on a digital scholarship project, contact the DiSC team at disc@emory.edu. DiSC is accepting proposals for the next round of digital scholarship projects; apply by April 20.